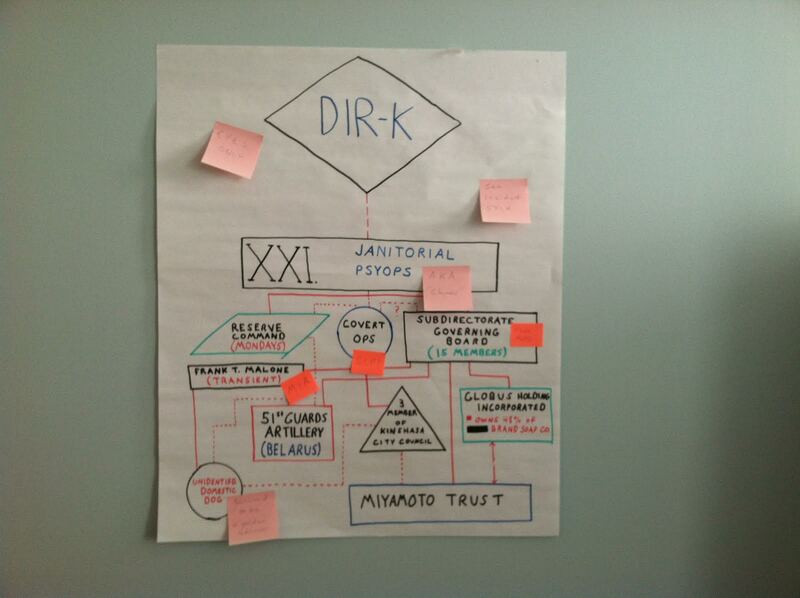 Attempted diagram of the organization of SCP-1659 sub-unit "Division of Janitorial Psyops"
Special Containment Procedures: Level 3/1659 clearance staff are limited to interaction in the field with SCP-1659γ instances. Per the terms of the 9 Mile Station Protocol, all interaction with SCP-1659α and SCP-1659β instances must be conducted through recognized diplomatic channels in the Department of External Affairs. The currently recognized ambassador to SCP-1659 is Dr. Danamir al-Qahtani. Due to the widespread nature of SCP-1659, containment is focused on suppressing public knowledge of the true purpose of activities carried out by SCP-1659 instances. Priority is to be given to activities with the greatest risk of resulting in violations of the 9 Mile Station Protocol. In keeping with Protocol requirements, any non-observational research of SCP-1659 is prohibited without express permission of the Department of External Affairs. Research staff must update the list of known SCP-1659 instances and the SCP-1659 Organizational Chart weekly to reflect current information. Recruiting preference for SCP-1659 personnel is to be given to those with backgrounds in sociology, political science, diplomacy, organizational theory, and culinary criticism. Description: SCP-1659 is a quasi-governmental organization transcending all known political boundaries and divisions. This organization is made up of at least 315,449 individuals who possess the inherent sense that they are part of a large, governing organization known to its members as "Directorate K". Individuals affected by SCP-1659 demonstrate knowledge not only of the existence of this organization, but which specific sub-unit they belong to, and a detailed sense of their duties to be carried out as part of SCP-1659. Interviews with affected subjects suggest that this knowledge is spontaneously obtained through unknown means, usually between the ages of 17-32. Once a subject is affected by SCP-1659, no known means are effective in eliminating knowledge of "Directorate K" short of systemic neurological damage or death. Individuals from throughout the world appear to be affected by SCP-1659 at random. The organizational structure of SCP-1659 is highly complex, and appears to have no overarching goal or purpose. Sub-units within SCP-1659 are given titles and ostensible missions; however, the work performed by members of a designated sub-unit often has no discernible connection with that unit's stated purpose. Foundation researchers have documented 1,297 sub-units to date. Apart from "Directorate K" serving as a central administering entity, the relationships of these sub-units to one another is currently impossible to determine; hierarchies appear to change regularly, and reorganizations of these units happen frequently. A retired electrician identifying himself as a technician attached to the "Office of Slime Mold Production" repeatedly spinning a coin on the ground at a crowded bus stop in Toronto, Canada. Three individuals claiming to work for the "Ennui Control Bureau" traveling throughout rural southwestern Slovakia, counting any observed instances of Muscardinus avellanarius (common dormouse), and text-messaging the results to a phone number listed at the Japanese Embassy in Lima, Peru1. A "Fifteenth Vinyl Division" work crew in a privately-owned truck traveling to traffic intersections in various towns in South Gyeongsang Province, South Korea, cleaning signs related to pedestrian safety. ████ ████████, police chief of ███████, Bolivia and confirmed SCP-1659 subject, continually building in his backyard a crude antenna structure 4 m in height out of tinfoil, disassembling it, and reassembling it. Individuals affected by SCP-1659 are not compelled in any discernible manner to perform their assigned "duties". However, subjects are almost always highly motivated to carry out tasks assigned by SCP-1659, and affected individuals display behavioral traits and attitudes commonly associated with organizations displaying high levels of morale and team cohesion. While observed activity of SCP-1659 subjects at the individual level appears to have no logical purpose, broader contextual analysis has revealed that SCP-1659 exhibits a profound ability to affect world commodities market fluctuations, cultural trends (particularly those related to food), real estate development, movement of refugee populations, and, to a limited extent, deployment of military assets. SCP-1659 is believed to achieve this through a combination of the sum total of the tasks its subjects carry out, its ownership stake in a collection of strategic private firms, and its placement of subjects in posts at all levels of government. In most cases, influence exercised by SCP-1659 is subtle and does not deviate significantly from general societal expectations, though this is theorized to be partly attributable to SCP-1659's agreement to abide by the 9 Mile Station Protocol. An exception appears to be trends in fine dining and culinary technology, upon which SCP-1659 has exercised profound effects. Many world-renowned restaurants are either owned or financed by SCP-1659, including ███████ in Paris, France; █████████ in Osaka, Japan, and ███████ in Catalonia, Spain. SCP-1659α: These individuals occupy leadership positions within SCP-1659, analogous to agency directors, minor political leaders, and other high-ranking officials. Approximately 2% of SCP-1659 are classed in this manner. Members of Directorate K itself, believed to be the central authority of SCP-1659, are part of this group, and are believed to number between 100-120 individuals at present. SCP-1659β: An estimated 15% of SCP-1659 instances belong to this class. These individuals tend to be tasked with duties resembling those of a mid-level official, and are usually supervisory or quasi-independent in nature. Many individuals in this group hold positions of authority in established governments at all levels throughout the world. ██████ ████, former Prime Minister of Gambia before being removed by Foundation operatives in the wake of Incident 1659A MIKE, is believed to have been one of these individuals. SCP-1659γ: The vast majority of SCP-1659 fall under this classification. These individuals perform tasks associated with the various sub-units of SCP-1659, and are thus the most likely to come to the attention of Foundation assets. While SCP-1659γ instances are drawn from a wide array of sources, a high proportion of these individuals are transients, inmates at penal or mental health institutions, or others that traditionally live outside mainstream society. The ultimate strategic aims or goals of SCP-1659, if any exist, are unknown at this time. Foundation researchers discovered SCP-1659 in 1983 after an investigation into reports of seventeen unaffiliated individuals chasing stray dogs through the streets of Budapest, Hungary with brooms, mops, and various cleaning implements. These reports coincided with a Soviet Union-organized economic conference occurring in the city at the same time. From 1983 to 1997, field research was conducted through standard clandestine means, yielding information suggesting that the scope of SCP-1659 and its potential effects on established society rendered it inherently uncontainable. SCP-1659 was accordingly classified Keter and assigned slot #14 on the Prioritized Threat Register. Given the nature of SCP-1659, Research Director Dr. Franz H. Ambroz attempted to establish formal diplomatic relations with SCP-1659. On September 1, 1998, a letter was received at the address established by Dr. Ambroz for official contacts, purporting to be from the "Directorate K Null Consulate". The letter stated SCP-1659's acceptance of an invitation to discuss formal relations between it and the Foundation, and a summit was scheduled for later that year. On December 18, 1998, Dr. Ambroz and a Foundation negotiations team arrived at the abandoned settlement of 9 Mile Station, California, United States, per instructions from SCP-1659 (the reason stated for the location being "we're thinking of building a restaurant here"), and met with Ms. Valentina Làconi, an SCP-1659 subject documented by researchers as being a bicycle mechanic residing in Scampìa, Italy. Ms. Làconi presented herself as "Null Consulate Chargé de mission for Foundation Affairs", and was the only SCP-1659 subject present. Ms. Làconi proved extensively knowledgeable in the practices of international diplomacy and demonstrated her position within SCP-1659 by ordering several SCP-1659 sub-units in specified locations to perform tasks requested by the Foundation delegation. Over the next several days, the Foundation delegation and Ms. Làconi discussed terms for the voluntary entry of SCP-1659 into containment. Agreement was reached on December 22, 1998, and was formally ratified soon afterward as the 9 Mile Station Protocol by Overwatch Command and Directorate K itself (which delivered its copy of the Protocol signed by nineteen code-named individuals via burro-mounted messenger to a pre-designated Foundation facility in Guadalajara, Mexico). Stated Goals of the Signatory Parties: The preamble to the 9 Mile Station Protocol states the Foundation's and SCP-1659's mutual desire for preserving a rational consensus reality for human civilization. While stating that the aims of the Foundation and SCP-1659 are different, a commonality of purpose sufficient for a formalized agreement is cited as the basis for the Protocol. Requirements on SCP-1659: Under the Protocol, SCP-1659 is not to engage in any activity that may alert any individuals or organizations not under its influence to its existence. SCP-1659 is not to engage in any activity causing extensive property damage or loss of life, except in pre-defined circumstances of self-defense, which must be promptly reported to Foundation personnel. SCP-1659 must limit its total number of affected individuals to <.01% of the estimated world population at any given time. SCP-1659 may not designate Foundation personnel as members of its organization. Requirements on the Foundation: Foundation researchers are permitted to observe and document all activities conducted by SCP-1659γ individuals. Foundation researchers are not permitted to interfere with such activities unless a breach of Protocol requirements is reasonably judged to be imminent. Foundation staff may transport SCP-1659 affected individuals to Foundation facilities for examination and interview, subject to permission of the Null Consulate and in accordance with Directorate K guidelines. No fewer than 30 individuals per annum are to be made available to the Foundation for this purpose. The Foundation may not harm, coerce, intimidate, or otherwise interfere unduly with any SCP-1659 subject unless self-defense exceptions are present. Requirements on both signatories: The provisions of the 9 Mile Station Protocol must be reviewed by a delegation from both signatories at a triannual conference, located in neutral territory. Amendments may be made to the Protocol subject to approval by both signatories. Neither signatory may be required to reveal information regarding total strategic and tactical assets, personnel levels, or high-level policy to the other. As of the time of this report, no violations of the 9 Mile Station Protocol by SCP-1659 have been observed. 1. Researchers were unable to determine if these messages were in fact received by any persons, as the cell phone corresponding to this number was not located. 2. No injuries to any individuals present were documented.